I have never celebrated St. Patrick's Day in my life... I'm not Irish, obviously, so it seems a little funny to dress up in green and drink beer in the name of something I have no idea about. Plus, I'm not a big drinker, so my festivities would probably wrap pretty quickly. All that being said, I will cook just about anything in the name of a holiday. Now, there is a bit of a story about me and corned beef. Up until last year, I had never had corned beef. Never. I know. But this is not the sort of thing my family cooked because we're Italian-American and "corned beef" never crossed our door. Then, last year I was in a writer's group that happened to meet in the conference room of our local grocery store. Seriously, best writer's group ever because my favorite place is the grocery! Haha. And one of the guys mentioned that corned beef was on sale because of Saint Patrick's Day. He was buying them up, so I had to ask what the deal was. When he told me how simple it was and delicious it was, I just had to give it a try....after all, it was on sale (two words I just can't resist.) Ermagerd, I was hooked! I went back and bought up a bunch of corned beef on sale and made it several times last spring. So this year, I figured I would do the same! I am firmly a fan of corned beef now. In some ways, I guess you could say that corned beef has made me a fan of St. Paddy's Day! This is sooooo easy. Anyone can do it. Anyone. You, me--even my husband could do this! Put your meat and the seasoning packet in your crock pot. Add your veggies, then four cups of water. Cover with a lid and let this sucker simmer away on low all day. But a word here on the "low" setting of your crock pot. I reccomend 8 hours of simmering on low. And god love me, I try so hard to follow this...and yet, I cannot. I have a deep-seated distrust of the low setting on the crock pot. So I like to put it on high first and then once it's really hot and bubbling, I cut it back to low. If I don't, I'll inevitably crank it up to high at some point. You could save yourself the trouble (rather, I could save myself the trouble) by just cooking it for four hours on high. Whatever you like to do. And in the end, besides your house smelling like a corned beef heaven, you will have this dinner! You don't even need a knife to cut the meat. MMMM. Time: 8 hours on low/4 on high | Serves 4 | Difficulty: So Easy! 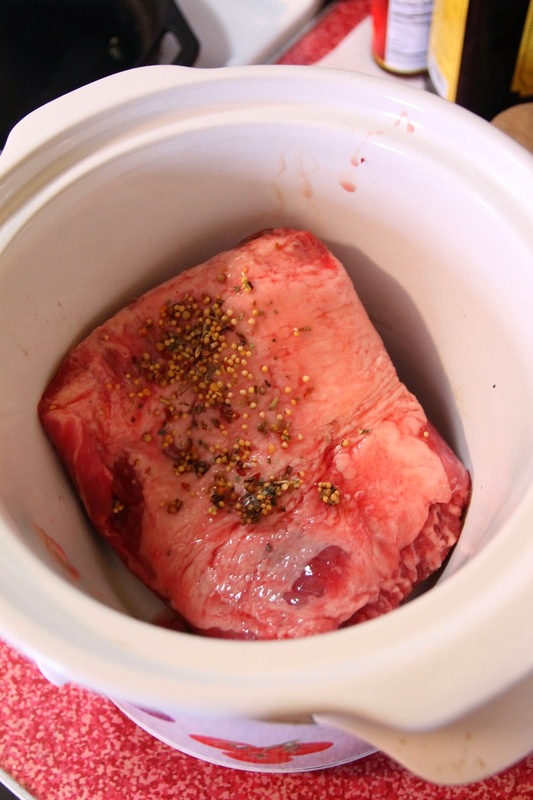 In your slow cooker add the corned beef and the spice packet that comes with it. Wash your potatoes well (I like to leave the skin on) and slice into hunks. Size it totally up to you, I like nice big bites. Peel carrots and chop into nice big pieces. Peel and slice onions. Add all your veggies on top of the meat. Add four cups of water. If you want, add cabbage during the last 40 minutes of cooking. We skip the cabbage. Serve with a smile, and maybe a salad, but really we just made a meal this all by itself!! !